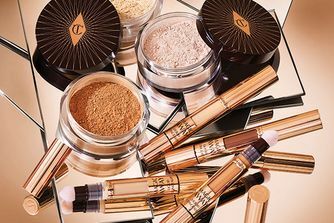 When it comes to concealer, Charlotte Tilbury's The Retoucher is everything a concealer should be... and more! With a featherweight flexible formula, there's no risk of product migrating or 'caking', while the nutrient-rich fluid is brimming with vitamins, antioxidants and a breakthrough 'Lipo-Siliconic' compound, to help diminish depth of fine lines, minimise pores and exhibit a 'plumping' effect. The inclusion of elastomer pearls then helps to guarantee a diffuse, 'soft focus' finish within seconds - simply apply using the brush and blend with fingers for a flawless look. Available in 10 shades to suit most skin tones. Twist up the end of The Retoucher and apply a small amount of concealer directly onto your imperfection. Pat concealer into the targeted area with your ring finger, it’s the lightest touch. Build up layers to your desired coverage. Professional make up artists have clean tools. Charlotte recommends you wash The Retoucher once a week to keep it clean and prevent cause of further imperfections. Let me start by saying that I’m a great fan of CT products. But this concealer is a product that simply doesn’t work for me. I got it in the shade 1 Fair and it has nice yellowy undertone so you’d think it would be great for covering under-eye. Unfortunately, it simply has a negligible coverage, sits weirdly under my eyes and doesn’t make the area look its best. Almost, sits on top of the skin as opposed to melting into it. Tried pairing it with my Benefit Booing industrial brightening concealer (as I always do to help first slightly color correct and then add coverage) but again, doesn’t seem to get along with the product. Despite setting it, it doesn’t look good and at the end of the day, my under-eye looks dry, with separated product. I hope the Magic Away is better but this one I’ll be de-cluttering from my collection. Not a bad product, but as I have found with so many CT products it's underwhelming. Doesn't last particularly well, yet is quite drying and sinks into any lines/cracks quickly. Not one I'll be repurchasing. Absolutely lovely concealer as said above by Sarah, however, yes - I ordered the medium going on the photo of the colour above and it is much much darker. Would buy a shade lighter than you think! This provides decent coverage and adds luminosity, but be aware that colours are darker than they appear - it would be best if you could swatch them in person before buying. This is the best concealer I have ever tried. It has such a beautiful finish and has a nice amount of coverage. It looks stunning under the eyes. This is the only concealer that has never creased on me. I don't even need to use that much powder to make it last all day. But as the others said, it is darker than expected so I recommend taking a shade lighter. As already said, the colours are darker than you expect. The finish is lovely and the coverage is good but it did creased more than I expected for the price. I would recommend. Initially blends out great, the colour match is nice, but it becomes quite heavy once it dries down, even when you aren't heavy handed with it. The packaging makes absolutely no sense as you are going to wash away so much product trying to keep that brush at the end clean, it's ridiculous. I will use this tub but I don't think I will repurchase.